I just know I want to try to stitch up the other jackets from the 1912 project but with limited time, I thought the mantle would be the sanest route. I had to learn how to grade this vintage pattern… and to be quite honest, I’m glad I don’t have much time to worry (I’m dressing up this weekend!). With so little time and every second set aside for different details, I had to just do it. Before actually studying all the stuff on grading, I figured I’d need to grade the body AND do an FBA. Here is the tutorial that helped me. Lots of visuals from Stitches and Seams (thank you!!). 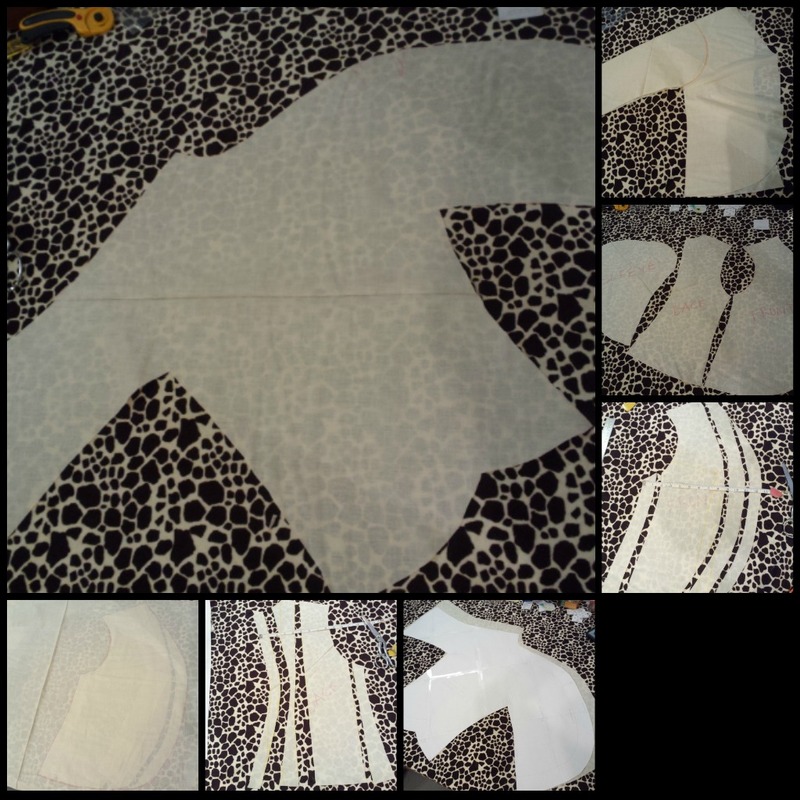 The basics of doing an FBA (full bust adjustment) with this kind of pattern, is to cut off the dolman sleeve, do your regular bust adjustment, and then reattach the sleeve. The FBA doesn’t affect the armcys much. I was anticipating some fudging. I’ve got the FBA how to in my head, so I’m good on that. Now, to get my head around grading the body of the mantle. I was directed to a couple of grading tutorials. One is on the So Vintage Patterns. The other on Threads. Reading through the Threads article, I saw I need an uneven grade and since the mantle has only gentle shaping, I might just be okay with the grading. The article does suggest that an uneven grade is more like an alteration, which actually calmed my nerves because I’ve done lots with pattern alterations. First step was to trace the pattern onto muslin. I never cut into a pattern I’ve printed and spent time taping together. I also get rid of the seam allowances so I can get a more accurate fit. I like altering the pattern and then tracing it onto muslin so I can do a quick try on. A lot of times, the muslin then becomes my pattern. This illustration from Threads helped me get me going. I mean, where do you cut so you can spread a pattern and grade it? Click on the image to get to the Threads page. Here are some photos to illustrate the steps I took. 1. 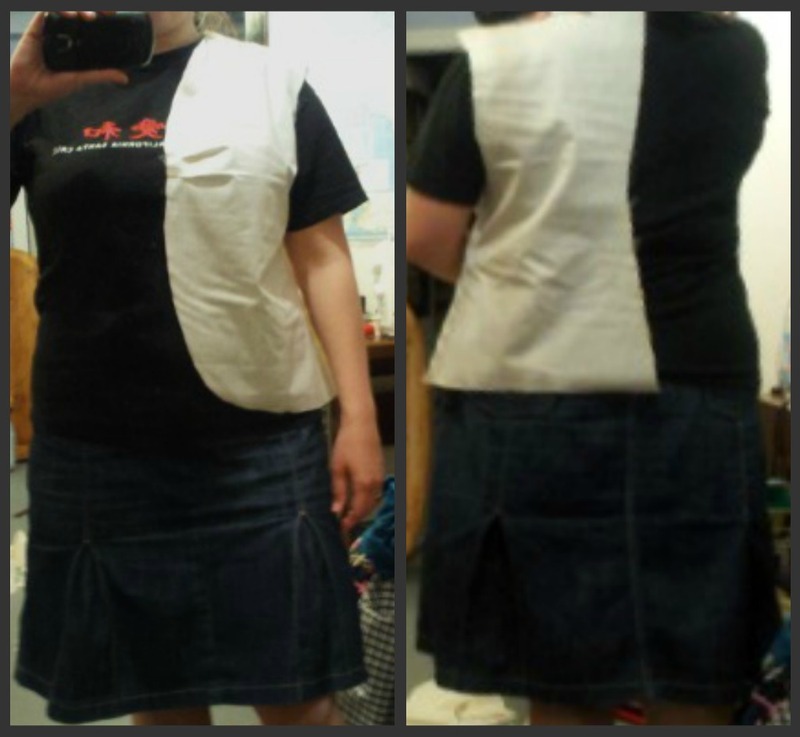 I cut off the sleeve and basically turned the pattern into a front bodice, back bodice and sleeve for my alterations. 2. I traced lines according to the Threads illustration. My gut told me to grade the front curve and back curve (the ones closest to the centers) on a curved line. I have no idea if that’s standard but it worked. 3. I made sure that the shoulder width was 6.5″ for my shoulders, and I also measured the front and back “bodices” and compared them to a jacket that I have that fits comfortably to make sure I was getting the fit I like. 4. Then, I placed muslin over my new graded front bodice and traced it. I did the same for the back bodice. 5. I trued my shoulder and armcys seams. 6. Since the sleeve fits me as is, I went ahead and placed all three pieces on my table and lined everything up. 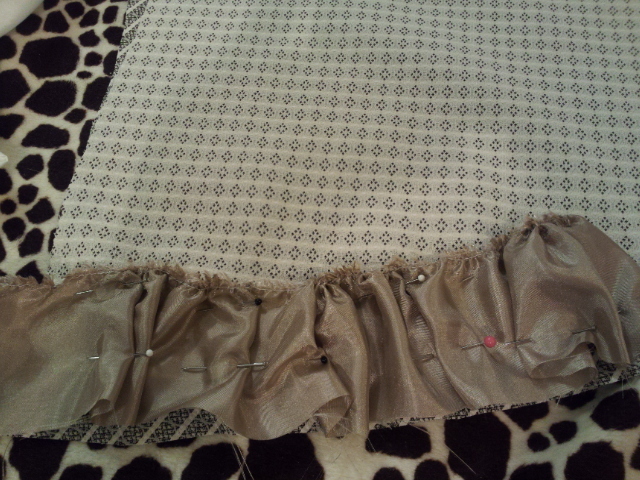 Then, I put another piece of muslin over the pieces and traced out my new mantle pattern. 7. I draped it over myself and found that the grading had been a success! I did move the darts down as my bust is lower than the pattern assumes. 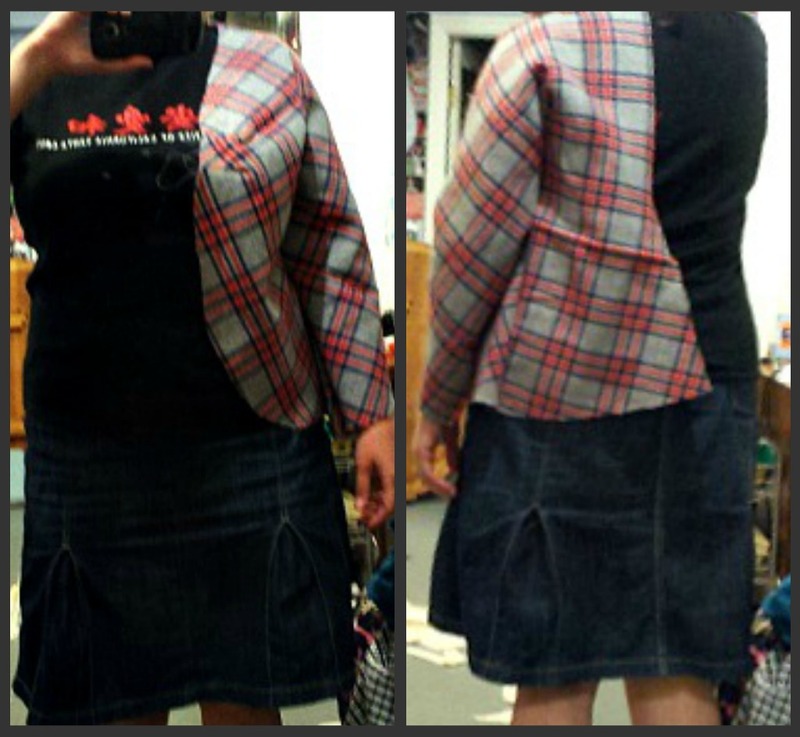 At this point, I scrapped the idea of doing an FBA and cut my fashion fabric, lining, flannel (for interlining) and the bias trim. Now, I’m off to make my trim. Here’s my mock-up of what the trim will look like. I’m so visual. Great job! I love that Threads article – I’ve used it a few times myself. Don’t you just love how patterns can be deceptively simple?? I’m finding that is also true with the 1912 wrap I’m working on. Thanks, Brooke. I do love the deceptively simple. 🙂 Can’t wait to see your wrap. You’re doing such a great job. Might as well get a good fit to start and I can see it’s going to look fabulous when finished. Thanks for the detailed process you went through, it helps to see what’s necessary to get the right fit. I also love Threads as a resource for all sorts of sewing questions. Looking forward to seeing pics of your finished mantle. Well, I have to say that I should’ve added length to the back. I have an idea on how to make it work but it would’ve been nice to get all the alterations done right. I would love to live closer to some sewing friends, for showing off as well as getting some help fitting. Asking my husband for help pinning things in the back is almost as successful as asking the cat (who actually looks like he would like to help). I use a dress form but she doesn’t have a sway back or straight shoulders. Certainly better than nothing. I hope you like the way this one turns out in the end and really enjoy wearing it. I know what you mean. I often feel like I sew in a bubble. My sewing room is more like a cave. I would love to know more sewing people near me, too.